The Birdie provides user a smooth transition and safe lift and/or transfer to or from bed, chair or even the floor. The Birdie maximises space for the user, even when the lifter is in the highest position, providing a very comfortable lift and transfer since the user can easily be rotated in the lifter. 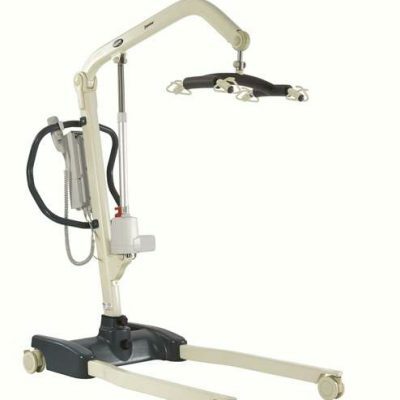 Consequently, it makes the placing of the user into the bed/wheelchair much easier for the carer and is capable of lifting a patient from the floor. Like the Birdie compact the transporting and storing of the lifter has been made easy to be folded and unfolded without the need for tools. Offering a intelligent monitoring system that includes service reminders, emergency operation, audio battery alarm and battery indicator. Standard features include 2 point quick attach spreader bar , internal charging cable, external battery charger and detachable battery pack. Specifications: The Birdie measures at 115cm (L)x 68cm (W) and range of spreader bars fully extended at 104cm. 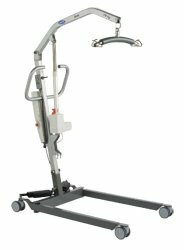 The adjustable lifter range from 47cm to 160cm means that this birdie lifter is capable of lifting a client from the floor. 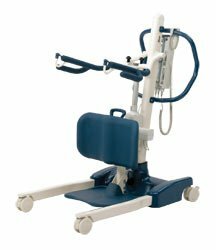 The Birdie comes standard with electric leg adjustment, has a weight limit of 170kgs and is ideal for nursing and care home environments.